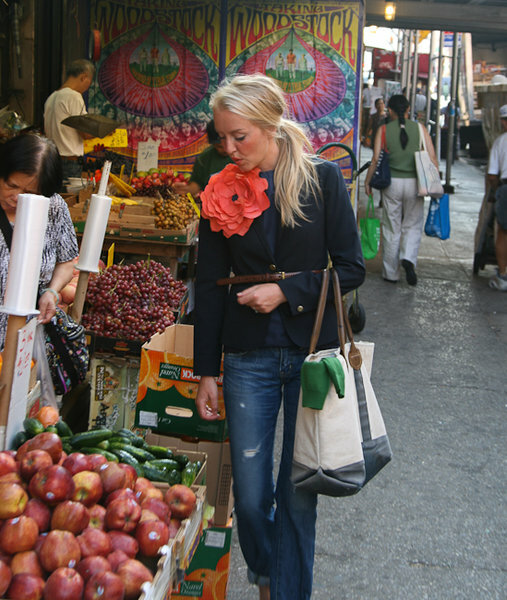 Emerson is the creator and model of the hip apparel and accessories line EmersonMade. She's the epitome of cool and leaves you wanting to be her new best friend. I've been following her online boutique for the last year and each time I visit I'm in awe of her creative photo shoots and lust-worthy collections. 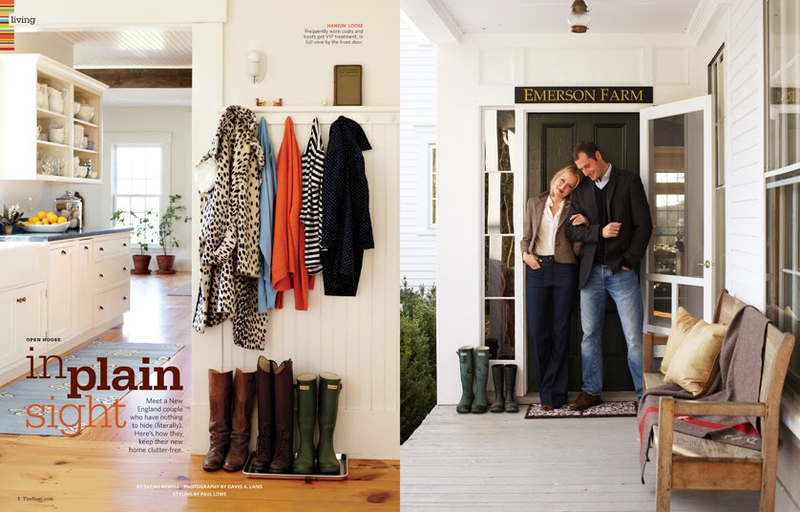 Emerson and her husband Ryan run the company from their beautiful farmhouse in New Hampshire. 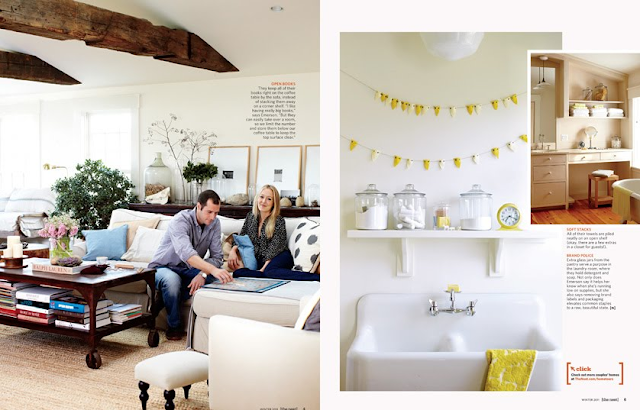 It's no surprise that I fell in love with their home featured in the new issue of The Nest. Their rule for a happy home--"Keep it simple and keep it in plain sight. No hidden junk." I love their stylish entry way, collection of big books and amazing open pantry. 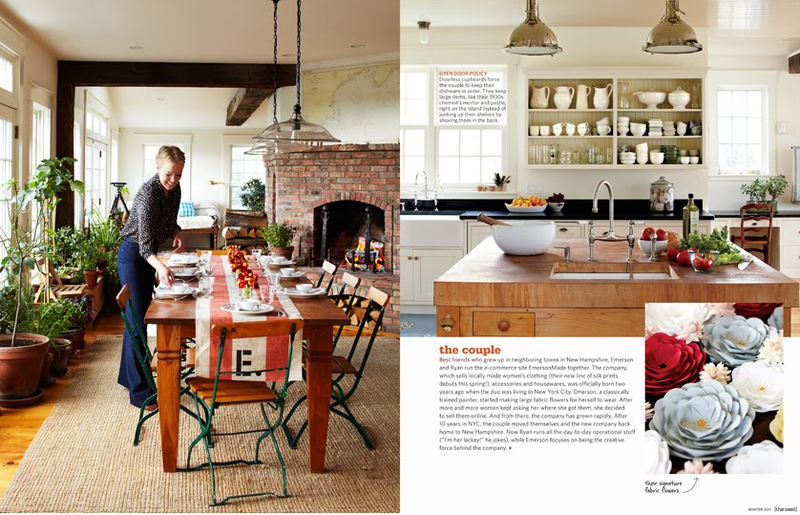 Their home was styled by Sweet Paul for the photo shoot. 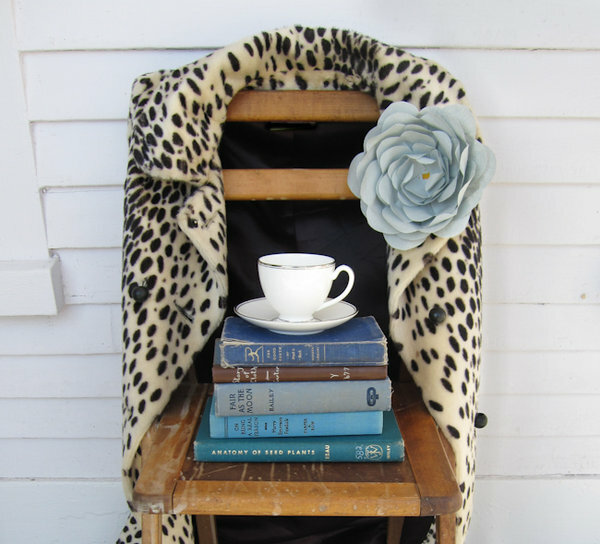 For more photos of Emerson's home check out this Design Sponge post. I think I am obsessed!! Oh, that outfit on the third picture, I NEED! It is fabulous! I love Emerson Made. I just got the cutest napkins from there. So incredible. Officially in love.. Every single photo is amazing! wow I didn't know all that about Emerson! I instantly fell in love with EmersonMade but didn't know the background and their home is so FANTASTIC i love her even more! AWESOME! I love Emerson Made! I have several of her flowers and I adore them. Love these shots - have been following their shop as well. Sweet Paul does the most amazing styling. Will hop over to The Nest after. Thanks for sharing. I am so obsessed. It is not even fair how much I love Emmersonmade. Emerson is so cute!! I love her, her company and her blog! Great post taylor, her house is adorable!! I am in love with her even more! And seriously adore that she looks so fun and happy. And I think Emerson is the cutest name! I love this everything about it is just PERFECT! omigosh, i'm obsessed with emersonmade...and now her house too! great post! This girl is so fabulous! She reminds me of you! I love that outfit she is wearing in the last picture. So chic! Emerson is too cool for words and I love her line! And her home is absolutely gorgeous. Giveaway @ B&B- enter for your chance to win a cozy flannel! Wow I just checked out her site- She's so adorable! Hard not to love her :) thank you for sharing! I know I love her!! She's as good with decor as she is with fashion! Omg I love this, so inspiring! I love that bathroom and all the bursts of flowers! Super cute! I love the pantry. I want to go buy some glass jars now! I love every single one of these photos! I'm a huuuge EmersonMade fan and loved the photos of their house! I just bought a pair of her jeans a few months back and love them soo much!! I love the flower pin! Such a pretty collection of inspiration. her place is so rustic but definitely has this charming, cozy vibe. very new hampshire indeed! i didn't even know the nest had a magazine! i'll have to check it out. I LOVE her house, but I don't even want to see it because unless I move far far away from California, I'll never have anything close to that! OOOh she has the Crate&Barrel bed frame that I covet!! I love that their style aesthetic runs true from the line to their home. That's having true taste! Their home is absolutely gorgeous, I remember bookmarking Design Sponge's post, it's a great inspiration (and aspirational) house! Their pantry is my dream pantry. Love the aesthetic. something I need in my life! Love EmersonMade, the first time I came across the site I was like, how had I never heard of this great brand. I love the styling and the wonderful photos! Ooh! I've got such a girl crush on Emerson and already liked "The Nest". That feature just solidified my likening of both that much more!